Watteredge Inc. (“Watteredge”) is one of the world’s leading designers and manufacturers of secondary power connectors, including electric arc furnace cables, resistance welding cables, high current DC switches, and industrial high-performance copper bus and accessories, all primarily utilizing copper. In an effort to continue to provide its customers with high quality product, the shareholders of Watteredge sold the Company to Coleman Cable, Inc. (Nasdaq: CCIX), a strategic buyer located in Waukegan, Illinois. MelCap Partners acted as the sell side advisor to Watteredge. 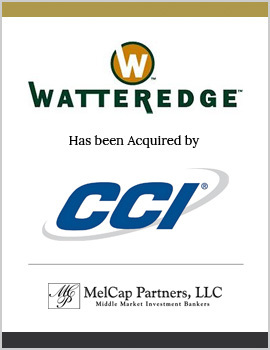 Watteredge was successfully sold to Coleman Cable, Inc.